Manginapudi is a beachside fishing village near Vijayawada. It is located at a distance of 11 km from Machhilipatnam. Earlier the village was being used as a port. The Manginapudi Beach features a natural bay and is home to shallow water. Instead of sand, one will find the black soil on the beach. The shallow water, the black soil and the historical significance as a port makes it a unique place for relaxation. Being located in the coastline of Andhra Pradesh, it is one of the most scenic beaches of eastern India. The calm sea and shallow water makes it a suitable place for water games. 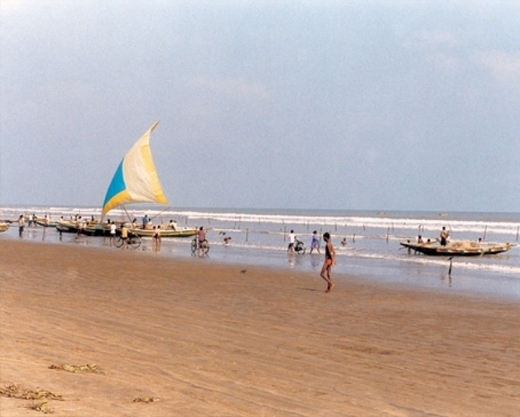 Most of the visitors enjoy a peaceful environment in this beach of Andhra Pradesh. The most beautiful part that attracts the tourists is the sea water. Safe water of this beach allows many of the tourists to take bath, swim and surf in the sea. Manginapudi beach is a great place to relax and rest. It is a perfect gateway to enjoy life away from the hustle and bustle of the city. The park located on the beach is too entertaining. It keeps the visitors attached to the beach and they get stuff for staying engaged on the beach. The park is a well decorated place and is surrounded with beauty. The place amuses both the adult and children alike. 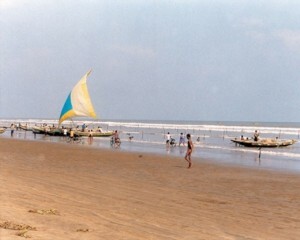 In Kartik Purnima, the beach remains crowded as many of the pilgrims come to take a dip in the sea. It is considered auspicious to take dip here in the sea. Apart from the beauty of this beach, the holiness of the beach too attracts the pilgrims. Manginapudi beach is famous for some adventurous activities too. One can greatly enjoy the water sports here on this beach. The beach here satiates both the adventurous and the serene need of the tourists. It is highly frequented by swimmers and boat riders. The Shallow water is the main reason why it is a favorite place for sports enthusiasts. This place is home to a temple of Lord Shiva. Visitors love to visit the temple while visiting the Magniapudi beach. The cultural heritage of Andhra Pradesh is also greatly represented by the Dance school located on the shore. Visiting the school allows one to learn about the traditional dancing form of Andhra Pradesh. It is great to visit this beach sometime between October and March. Accommodation is not plenty near the beach. One can stay in Machhilipatnam. There are many budget hotels that any visitor can afford easily. One can reach by rail route. The nearest station is Machhilipatnam. The bus route is also easier for catching buses to Machhilipatnam. Machhilipatnam is only 15km away from the beach and one after reaching the station can hire a private taxi to reach the beach. The nearest airport is Vijayawada. It is 85km from the beach and one can hire a taxi to reach the beach easily.